If you are looking for a easy-to-use app with huge amounts of information from virtually any football league in the world, OneFootball for Windows Phone is your app. This weekend here in England will be the start of the 2014-2015 football season. All the leagues, most notably the Premier League and the Champions League, start in earnest as do many of the European leagues across the continent. 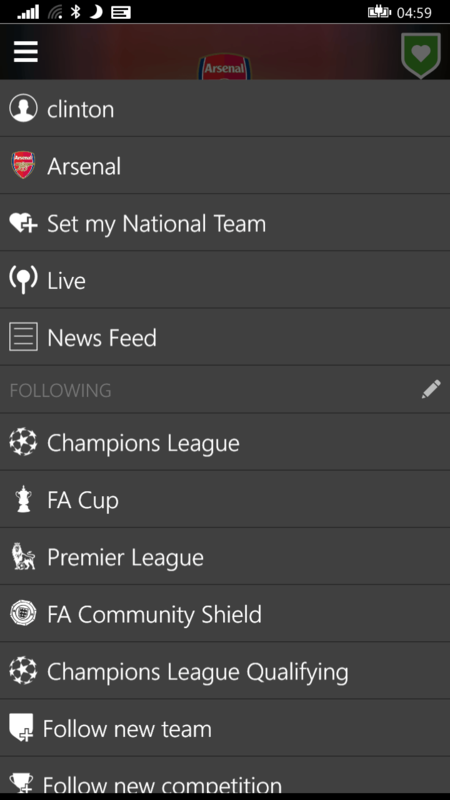 Over the last few weeks I’ve been looking for a good app for Windows Phone to follow my favourite teams along with keeping up with news from around the various leagues. I think I’ve found it in OneFootball for Windows Phone. OneFootball for Windows Phone allows you to select your favourite team and follow them in detail as well as get push notifications during matches (when you can’t find your way to the pub to watch for some reason) and detailed information on each match and the season. Further, you get a great news feed of all the information from across all the various national leagues and can even go into another league and setup notifications for a particular team. All this in an app that is free. Once you have your club selected you are taken to that team’s page in the OneFootball for Windows Phone app where you will see the next match that your club is playing. Swiping left or right across the schedule will show you the result from the previous match and the match scheduled after the current one. You also will see the kickoff time and below it you will see news on your club from various resources such as the club’s Twitter feed. Swiping the team banner menu will allow you to see the Season page where you can see where your club is in the league tables. Scrolling down will let you see how your club as done over the course of their last 7 matches and further down you will see stats such as the club’s average goals per game, goals conceded, passing accuracy and ball possession. With the Premier League not quite started I took a look at my other home team, FC Dallas in the Major League Soccer league in the United States (I am from Dallas after all) so you can see the club season page detail. As you view your club’s page in OneFootball for Windows Phone you can swipe across your phone and see the Squad page which shows you all of the players and the manager for the team. The page is split up into the player positions so you can catch up on the any new players your club may have acquired in the off season. You can also tap on a player and get their vitals – age, height and weight – as well as how they have performed in the season with their stats. If the player has a Twitter feed you can also see that on the player page. allows you to see in real time the matches that are scheduled or in play and the latest scores. Some of these will be live events while others will give you live updates. It is a great way to catch up with all of the matches going on during the day. Finally you can view information on virtually any league in any country from the apps menu. By default the leagues for your country and favourite teams will be first followed by a list of nations for which you can see information. The list of countries is impressive and it is a truly global list. 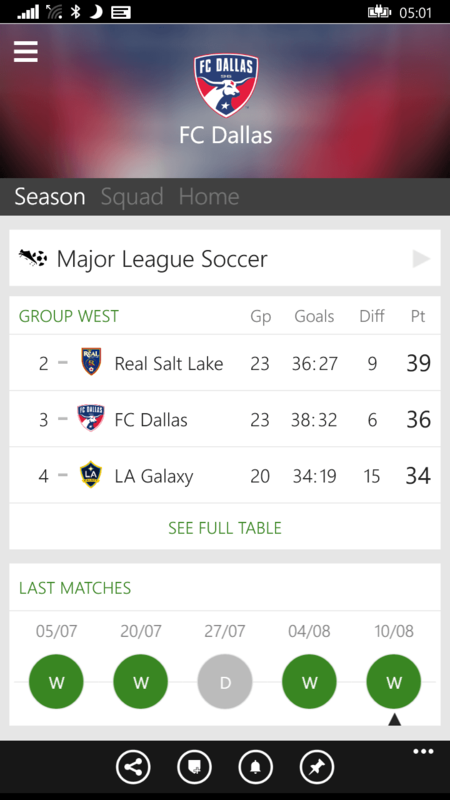 Although I live in the UK, I have a keen interest in seeing how FC Dallas do in the MLS in the United States. OneFootball allows me to do that all within one app and I can even get push notifications of their matches if I want to configure them. 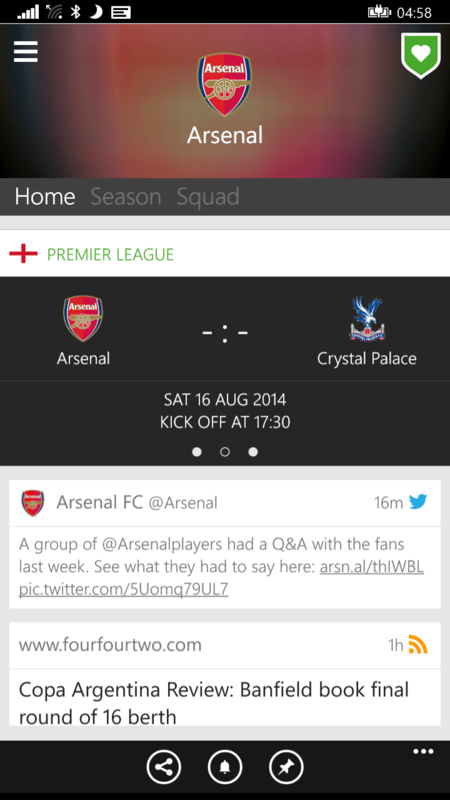 Basically if there is a major football league in the world you want to follow you can do it in this app. 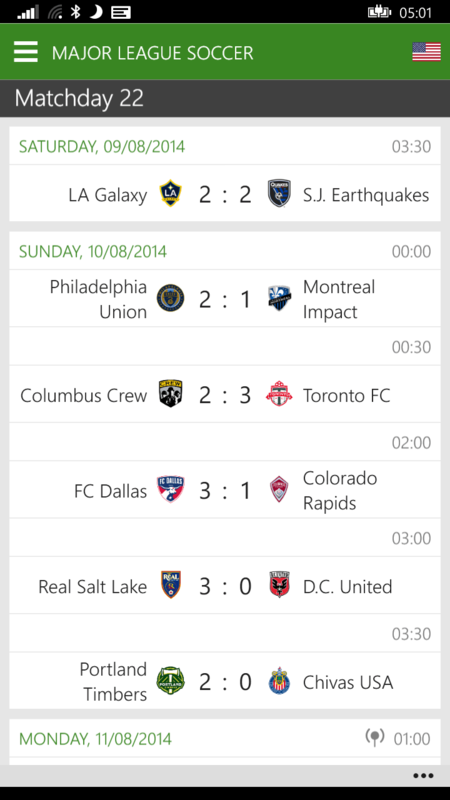 Since moving back to Windows Phone I’ve been searching for a good football app for the upcoming season. I found a great one in OneFootball for Windows Phone. The amount of information in the app is impressive and it is not just focused on one or two leagues but literally all of them across the globe. 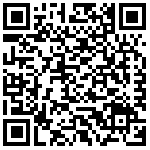 If there is information you want to find out about a league, club or player, chances are you can find it in this app. Performance wise the app is equally as impressive. I have installed it on my Lumia 520, 635 and 1320 and it has behaved with no issues on all of them. 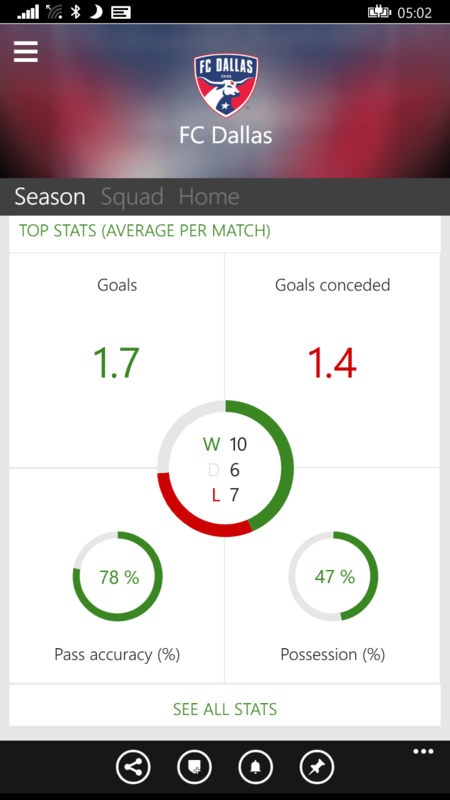 OneFootball for Windows Phone is in the Windows Phone Store and it is free. If you register for a free OneFootball account you will be able to interact with other users (chat sessions) but it is not required.